It says Aliyev, from the New Azerbaijan Party, is enjoying the overwhelming support of Azerbaijanis. The news comes after it was announced that more than 550 international observers will be in the country to monitor the elections. Azerbaijan has also invited the European Union to observe the presidential election, due to take place on April 11. The delegation may include the Czech Member of the European Parliament Jan Zahradil who recently hailed Azerbaijan as a “strategic partner of the European Union in many ways.”The ECR deputy said the EU had entered a new stage in bilateral relations and that he believes Azerbaijan is interested in developing all-round cooperation with the EU and its organisations. With the elections looming, a national parliamentarian said the vote represents a “new step forward” in the country’s push towards a full democracy. Nasiro said that concerns voiced about the electoral process by the OSCE’s Office for Democratic Institutions and Human Rights were groundless, adding, “I hope that this organization will abandon its groundless attitude towards Azerbaijani society.Unfortunately, in most cases the organisation obtains information from unreliable sources and misleads the international community.” Meanwhile, George Birnbaum, Executive Director of Arthur J. Finkelstein, said his firm's survey shows Aliyev holds a commanding lead with 82.9% of the voters saying that he will be their choice on election day. 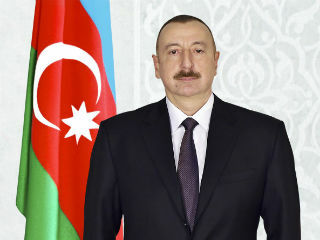 Research shows that Azerbaijan’s security and economic issues are among the top priorities among voters, which is reflected in the large support for Aliyev. According to the poll, 79% of the voters polled said that Aliyev is “working to enhance and improve economic conditions for the population.” “This positive recognition for the job the President is doing is the reason he has the electoral support of the nation,” Birnbaum said. The vast majority of Azerbaijanis believe Aliyev is protecting their country, with 73% saying he “is keeping the country safe”. The survey of 1,500 likely voters was conducted March 13-22 in collaboration with the local organisation Citizens Labour Rights Protection League and was a representative sample of the population across geographic and demographic factors. The margin of error is +/- 2.5 per cent. Eight candidates are campaigning for the office of president. Apart from Aliyev they are: Oruc Zahid Maharram, Self-nominated; Alizada Araz Mammad Mubariz, Azerbaijan Social-Democratic Party; Hasanguliyev Gudrat Muzaffar, Whole Azerbaijan Popular Front Party; Guliyev Farac Ibrahim, National Revival Movement Party; Hajiyev Hafiz Alamdar, Modern Equality party; Nurullayev Razi Gulamali, From "Front-Line" Initiative Group and Mammadov Sardar Jalal, Azerbaijan Democratic Party.